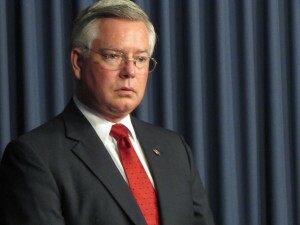 Maricopa County Attorney Bill Montgomery was one of the most vocal opponents of the Arizona Medical Marijuana Act in 2010, and fought hard to kill it after voters made it the law of the land. This week, his years-long crusade to overturn the law ended with a whimper. Montgomery didn’t return a message seeking comment. The case between the county and a Sun City dispensary began in 2011, and the ACLU joined local lawyers in medical marijuana’s defense the following year. The county’s elected top prosecutor told Phoenix New Times in 2012 that he hopes the case was the “dam” that blocked up the medical-marijuana program. He’s been met with defeat time after time in the case, as New Times has covered. It started six years ago when the anti-cannabis warrior advised the five members of the county Board of Supervisors to “opt out” of the voter-approved program, claiming it violated federal law. They took his bad legal advice, and the county was promptly sued in June 2011 by White Mountain Health Center Inc., which wanted zoning approval to open a dispensary in Sun City. Yet the case was actually a trap set by Montgomery. Marijuana activist and bong-tool inventor Daryl “Butch” Williams had been granted the license only for that general location — it was either sue or perish. Montgomery eagerly began using the litigation to build his case against the state law itself. He was soon joined by then-state Attorney General Tom Horne, who had already tried and failed once to overturn the law in federal court. The pair put out a gleeful news release in August 2012 announcing their latest filings in the case, which sought a state court opinion to “resolve conflicting issues” on whether or not the medical-marijuana law was pre-empted by federal law. Dispensary company operators watched the case closely. In many cases, they had their shops ready to go, but couldn’t start serving the growing population of card-holding patients with the question still unsettled as to whether cannabis could be legally sold in the state. Then, on December 4, 2012, Maricopa County Superior Court Judge Michael Gordon ruled that the medical-marijuana act didn’t violate the law, and the state dispensary industry took off. Two years later, White Mountain became the 84th dispensary to open in the state. Montgomery and Horne kept up their fight for federal rights after Gordon’s decision. In a later decision on the case, Gordon called the county’s actions against White Mountain a “transparent attempt” to stymie the law. Despite years of failure, Montgomery took up a fresh attempt at an appeal in the case earlier this year. But the current state Attorney General, Mark Brnovich, decided that the state would not longer be a part of it. Undeterred, Montgomery tried to make a final stand in state courts — and was turned down in September by the Arizona Supreme Court. That forced him to decide whether he wanted to chance it at the U.S. Supreme Court. He apparently decided that six years and an estimated $1 million bill for taxpayers was enough. Andersson, who’s worked on the case from the beginning, described how the issue of states’ rights allowed the case to prevail for the dispensary — and for Arizona voters — at every step of the legal game. Ultimately, it all starts with the framers of the U.S. Constitution, she said. “The framers thought we would have greater freedom and greater liberty as individuals if there were two sets of sovereigns, essentially — the state and federal government,” Andersson said. “Part of that structure of our government is that the federal government can’t force states to enforce federal policy. This is our Tenth Amendment argument — it’s a states’ rights issue. The federal government can prohibit marijuana all it wants. But given the current law, the federal Controlled Substances Act, which specifically carves out space for the states to have different types of drug policy, the feds can’t force the states to enforce federal law. As of November, about 152,000 Arizonans had medical-marijuana cards, and they’re being served by about 130 dispensaries that sell all types of cannabis products, even while federal law prohibits the possession or sale of marijuana. The power of voters and states’ rights is in full display in Arizona. Maybe Montgomery finally sees it.